Around the lower left (eastern) star (above and left of center in the above image) in the belt of Orion are many faint nebulae. At the very top of the image is the center star of Orion's belt called Alnilam. 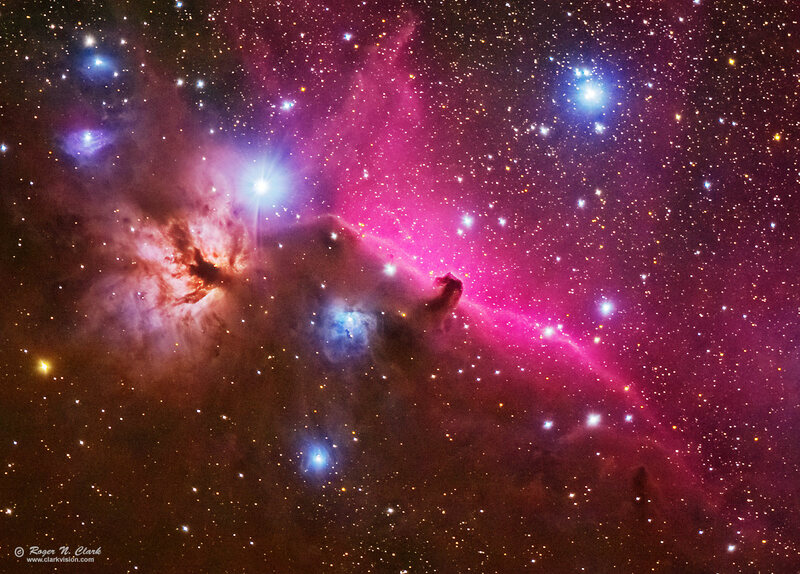 The beautiful Horsehead nebula (center) is made of dark dust in front of an emission nebula (reddish-pink). The bright nebula to the lower left of the belt star is the emission nebula NGC 2024 (to the left of the Horsehead nebula). The full resolution image shows stars of about magnitude 19.6 (single one-minute exposures show stars to magnitude 17.3), and this image, 60% of full scale goes almost as faint. The Horsehead nebula is visible in 8-inch diameter telescopes from a dark site, but on this night, the sky was bright from airglow and a 12.5-inch aperture telescope failed to show the Horsehead nebula visually. Technical. Canon 7D Mark II 20-megapixel digital camera and 300 mm f/2.8 L IS II at f/2.8. Seventy 60-second exposures at ISO 1600 were added (70 minutes total exposure). No dark frame subtraction, no flat fields, no noise reduction. Tracking with an astrotrac. The Horsehead is a very faint nebula, so this image demonstrates that the 7D Mark II is an amazing low light camera for it to record so much detail in this exposure. Full size image is at 2.8 arc-seconds per pixel, and the image here is 60% less (4.7 arc-seconds per pixel). CEFA = 49900 minutes-cm2-arc-seconds2 (2.8 arc-seconds / pixel). Calibrating intensity using stars in the image, I calculate the image reached a surface brightness limit of about magnitude 25 per sq arc-second. That means the faintest signals are only about 63 photons in the 70 minutes of exposure (S/N = 1), or less than 1 photon per pixel per minute of exposure. The limit is due to airglow. With no airglow, signals 1.5 magnitudes fainter would have been reached, and the limit would be due to noise from thermal dark current in the camera. Airglow was 21.1 magnitudes/sq arc-sec in the DSLR green passband during the imaging sequence. The bright area around the Horsehead has a surface brightness of 19.3 magnitudes/sq arc-sec. This is for the camera green passband, the closest I can get to visual with DSLR passbands. There is a second dark nebula to the lower right of the Horsehead. The difference between this dark nebula and the brighter surroundings meant a difference in light with my system of about 1.2 photons per minute per pixel. The "bright" part of the nebula has a surface brightness of 22.5 magnitudes/sq arc-sec. So the dark nebula and its surroundings are 3 magnitudes fainter then the Horsehead nebula. Modern DSLRs like the 7D Mark II include on sensor dark current suppression and low fixed pattern noise at ISOs around 1600 and higher, making no need for dark frame subtraction. Modern raw converters correct for light fall-off and also correct for hot/dead/stuck pixels. This makes processing low light images easy: simply align and average. The above image was further processed with Richardson-Lucy deconvolution to improve detail using multiple iterations with 7x7 and 9x9 pixel Gaussian profiles. See my series on Astrophotography Image Processing and Image Sharpening for more details. The color balance is true color, meaning this is a stock camera with very close spectral response similar to the human eye. Astrophotographers often modify cameras for increased sensitivity to Hydrogen-alpha emission (red). Hydrogen emission nebulae actually appear pink due to H-alpha (red), H-beta (blue) and emission from other atoms, like oxygen and sulfur. Modified cameras over emphasize H-alpha, making hydrogen emission nebulae come out red in photos. The orange in the image is the color from dust. Unmodified cameras do a better job at color separation of the various processes that occur in the deep sky. Modified cameras tend to show mostly red in areas like that in this image, making it too difficult to tell the difference between dust and hydrogen emission nebulae.